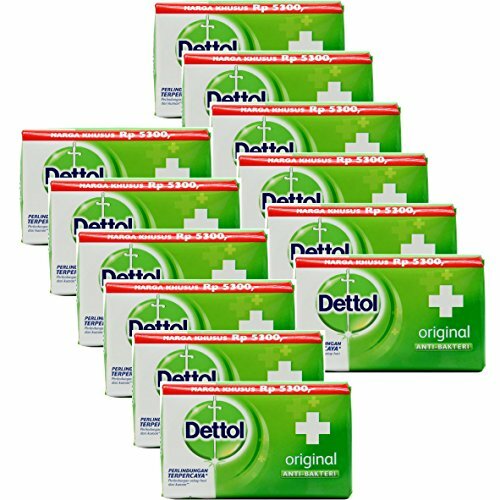 Dettol is the trade name for a line of hygiene products manufactured by Reckitt Benckiser. It has been in use since before the 1950s. Washing away germs and impurities everyday is crucial in maintaining good health and hygiene; taking a good bath with an effective soap is thus very important. Dettol as a brand has been synonymous with superior hygiene and protection; this Dettol Original Soap gives you protection from bacteria and germs quite efficiently. More reasons for you to like this soap are that this soap not only keeps you germ free but also gives you the benefits of a beauty bathing bar; the soap is also very gentle on the skin. If you like fragrance and a luxe feel in your bathing soap but you also want to ensure that the bath does away with all the impurities and germs, then this Dettol Original Soap suits your needs perfectly. You are sure to enjoy a great bathing experience that ensures maximum hygiene, freshness and soft skin, As this soap is gentle on your skin, you do not have to worry about dryness and roughness. The benefits of this Dettol Original soap can be enjoyed by your entire family, both men and women. It is certainly worth bringing home this pack Dettol active soaps as you get to ensure that your family enjoys good health and freshness. A new formula that kills 99.9% of bacteria and remove viruses for clean hands and body everyday! If you have any questions about this product by Dettol, contact us by completing and submitting the form below. If you are looking for a specif part number, please include it with your message.